Funny things happen when you get older. You start to ache in places that shouldn’t ache. You start to get pains in places that shouldn’t be in pain. You begin to forget little odds and ends here and there. I’m sure that most of you can relate (if you can remember)! Well, one of the things that I’ve found to be different about me today versus me as a child, teenager, or even young adult is that today I enjoy going to church. That’s right. I enjoy going to church. This is my new church - it's a really great house of worship. I’m sure that there are scores of CCD/Sunday school students, kids, and teenagers who would read that comment and say, “Blech! Church is SOOO boring!” I know. I said the same thing just a few years back. But it’s true – I enjoy attending mass each week. Before some of you think that I’ve turned into a holy roller or a crazy religious person let me be very clear that that hasn’t happened at all. From time to time I’m unable to go to the weekly mass service and I don’t get hysterical when that happens. Sometimes you just can’t make it to church and as long as your reason for not being able to attend isn’t frivolous, then God understands. However, as I get older I’ve found that I’ve grown into a routine. We all have our routines. You wake up to a certain rhythm, you get ready for bed with a certain rhythm, you arrange your office to a certain rhythm, etc. Over the last few years I’ve found that after I added regular spiritual worship to my weekly routine via weekly mass and (more recently) the occasional penance service, that I really do enjoy attending these services. They’re short, to the point, and a good chance to get out and be part of something bigger than yourself. And if there is anything that is bigger and more worthy of our attention than ourselves then it obviously has to be the Church. The church that my Grandmother attended when she was young. One thing that I’ve been missing in my worship is a dedicated church and parish to call my own. To fix that problem, I spent the better part of each Saturday afternoon and Sunday morning over the last few months trying out different churches. Below you can find some thoughts on what I was looking for in my search for a new church. Interior Church. Let’s face it – we are all greatly influenced by our surroundings in all that we do. When it comes to worship I think you need to be in a place where you feel a good mixture of comfort, reverence, austerity, and ritual. Proximity to Current Area. Even though I haven’t moved to a new apartment in three and a half years, I still move around a lot more than other people in my age group. Not having a set place to call home really bungles up some things in life including finding local communities in which to participate. Finding a parish that was near to my current location was important to me because I’ll probably wind up staying in this general area for the next few years. Volunteer Opportunities. Many folks who read this blog wonder why I spend so much of my free time volunteering. Well, I enjoy the whole volunteering process including helping people. Understand where I’m coming from, though – I have a few large-scale, national volunteer obligations coming to an end in the next year and I think the next time I dedicate a great portion of my “time, talent, and treasure” to a cause I would like for it to be closer to home. So, the availability of volunteer opportunities is important to me. The Process of the Mass. This item may seem a little bit weird to those of you who have not been to multiple Catholic churches, but one of the things that I’m looking for is a little bit of commonality in my masses. Sometimes I got to a mass and I can’t follow the basic parts of the service because the particular church that I’m attending has their own music, process, and/or added verses. For example, I can’t tell you how many different times I’ve heard the “Gloria” sung with different words, added words, different melodies, different tones, etc. It gets confusing and, frankly, a bit annoying. Makes me wonder about the fuller impact of the Third Roman Missal, but that’s a blog entry for another time. The Songs. The parish that I wound up registering at has an excellent selection of music for each service. They don’t choose obscure songs in the hymnal, but instead choose songs that the people will probably know. For example, during the Christmas season at my church we’ve sang Ode to Joy, Hail Holy Queen, Silent Night, Angels We Have Heard on High, God Rest Ye Merry Gentlemen, etc. There’s no reason to sing some ancient, old song that no one “gets” these days. The church that I registered at understands that fact and gives the parishioners the opportunity to sing songs during mass that are known in most households. 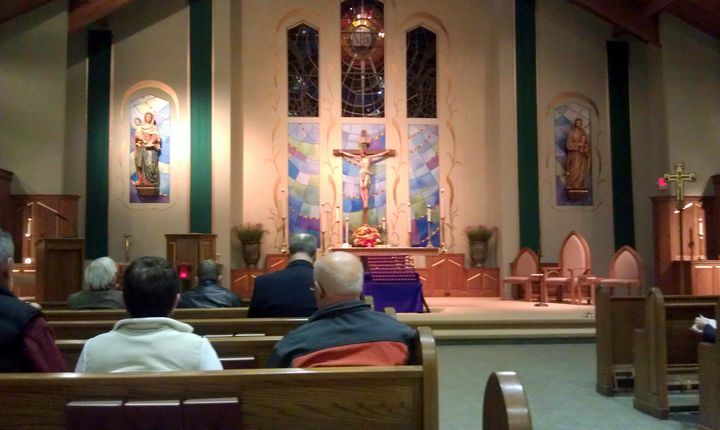 The first picture in this entry is a picture of St. Catherine of Siena Church in Farmingdale. It is a great place to worship. The second picture above is from Our Lady Star of the Sea Church in Long Branch. This is the church that my Grandmother attended as a child with my Great Grandfather and Great Grandmother. Of all the churches that I attended, I would prefer to attend Our Lady Star of the Sea simply because of the family connection. However, this church is a bit far from where I live – about 25 minutes away – so I only plan to attend services at that building every once in a while. There you have the summation of my great church search during the latter part of 2011. 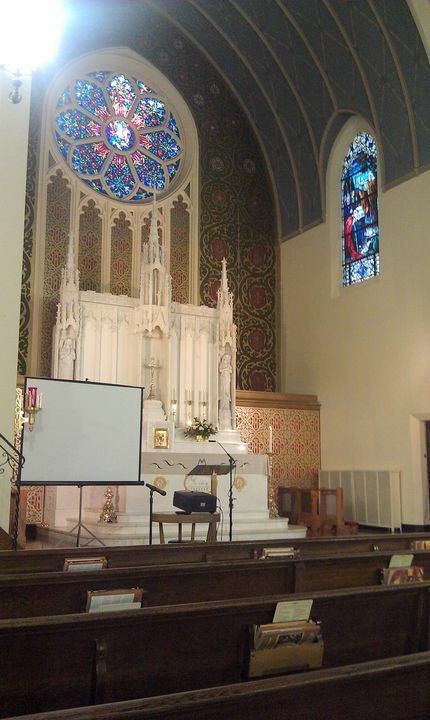 I’m very pleased with the church that I wound up registering at which is only about ten minutes from my house. The interior of the church is beautiful and they keep it very clean and tidy. There seem to be ample volunteer opportunities if at some point in the future I decide that I want to volunteer for the church locally. There is a very consistent, very by-the-book process for the mass. The songs are all well-known and not obscure, random songs that don’t connect with the congregants. It appears to be a great parish to grow in faith and I’m looking forward to continuing to attend services there in 2012. Congratulations go out to the Sigma Pi Fraternity brothers who won on Election Night last night! First to Brother Mike Beebe for winning the Governor’s race in Arkansas. I had the chance to meet Mike in New Orleans this past August and he seemed like a genuinely good guy to me. The people of Arkansas have elected a good man to be their Governor. Second, congratulations to our former national President, Don Cox, who won a town council election in Ewing Township, New Jersey. Don is a passionate volunteer and will bring the same dedication and commitment to service to Ewing Township that he’s brought to our fraternity. Congratulations also go out to Mrs. Barbara Gorman who won a seat on the Absecon Town Council. Mrs. Gorman is the mother of one of New Jersey’s most dedicated alumni volunteers. If she can do for Absecon what she taught her son to do for the fraternity, then I might be moving down to that part of the state really soon!